www.HoffySwims.com: 2 Swims in The English Channel in Brighton in 2 days - Loved it! 2 Swims in The English Channel in Brighton in 2 days - Loved it! 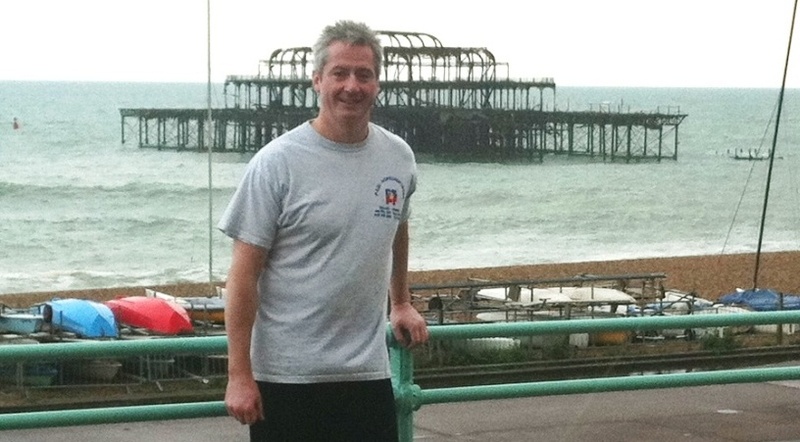 This week I have been in Brighton again for 3 days as part of my ongoing Advanced Clinical Massage training. Carpal Tunnel Syndrome and Wrist and Arm Pain was the topic. 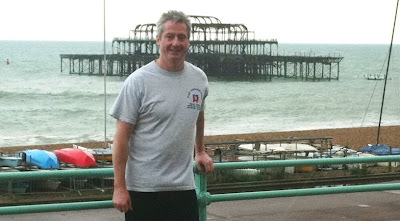 During the first day, I made up my mind that I was going to swim round The West Pier, Brighton's most photographed building which was destroyed by fire in 2003 but soon to be replaced by the incredible i360. So nearly 11 months after getting in any sort of water other than the bath or shower, I left the course at 5:30pm, headed back to my hotel, changed into trunks, T-Shirt and flip flops, and headed for the beach, towel, goggles, hat and earplugs in hand. I was on a mission. It felt strangely exciting, like something I had never done before. I walked down the beach and got ready, heart thumping 13 to the dozen at the thought of swimming right round this mighty structure in front of me. Above: The West Pier, Brighton, by photographer Nicole Carman. I went through my usual (when getting in cold water) routine of stepping in, bending over and splashing the cold water over me. It felt frigging freezing! Yet, it was probably about 16 Degrees C. About the same temperature as I had spend nearly 14 hours in exactly 4 years and 3 days ago on my first English Channel Swim. I kept on walking in, then took the plunge. Literally. I dived in and started swimming slowly. The stroke was fine, water felt quite warm actually, and so I headed off for my trek around the pier. I stuck to the outside of the buoys. I assumed they were there as there was steel on the seabed after the fire. I was a bit worried as I had no idea how deep it was or how far below the surface any steel may have been. But the sea was as flat as a mill pond, and I felt OK. Not very fit, but OK. I pulled up level with the end of the pier, then turned left and swum around the back. The vast rusty steel columns were very intimidating and really quite eerie. As I swum around the back, I had a feeling of being along way out, alone and not really very sea swim fit for being out here on my own. I kept going, then turned left and headed back towards shore. It felt good. As I passed the end of the pier, I cut in and headed back to my starting point where my towel would hopefully still be laying. I made it to shore feeling very pleased, but as I stood up, I felt extremely dizzy. I kept wanting to fall over to the left. It was all I could do to stand up. Like a type of vertigo. My head was spinning. I steadied myself and just stood there until it disappeared. Weird indeed! Never experienced that before. But I had done it! I walked back to the hotel in my trunks and settled in for the night, determined to do the same the next day. At the end of day 2 of the 3 day course, we were all invited out to dinner by the course instructors, Rachel and Sue. This was to be at 7pm. So I rushed back to the hotel and went through the same routine as the day before, heading off to the beach determined to swim around again. When I saw the sea, I couldn't believe the difference to the day before! The tide was coming in at about 45 degrees to the pier, and the waves were huge. I know we swimmers do tend to exaggerate about huge waves, but these were big buggers, especially when you are not sea swimming fit. I didn't care, I was going in. I went through the same routine and eventually got in, literally being battered and beaten back by the force of the incoming tide. I started to swim forward and got hit again and again by the waves. This was tough, but the worst thing was I was getting swept towards the large steel girders of the pier at incredible force. I am never sacred of the sea, but I do respect it. I decided that if I swum behind the pier, I would be swept into the steel, so I decided to swim along to the end of the pier then come back again. On the way out, I swum away from the pier at 45 degrees, which compensated for the sea coming in at 45 degrees. This meant that I swum in a relatively straight line. Clever I thought! On the way back, I did the opposite. I swum toward the beach at 45 degrees into the tide which meant again I swum in a relatively straight line. But on the way back, the waves picked me up and hurtled me downwards, one of them pinning me to the seabed for a few seconds. I didn't panic, let it pass, then carried on my way. I arrived back on dry land, experienced the dizziness again, but not so badly, then walked back to the hotel, showered and met up with the rest of the people on the course for a great dinner. I am really pleased to have completed these two very contrasting swims, back in the pool now until I visit Brighton again in September for the advanced sports stretching part of the course. 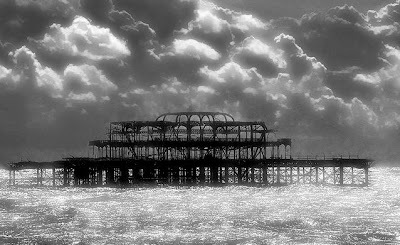 Many thanks for posting one of my photographs of the West Pier. No problem. Your photos of The West Pier are stunning. Contact me @ paul@bodyandmindstudio.co.uk and we can char about further collaborations.